Those getting hip to oh say, the sounds of African Guitar Pop have it a lot easier. No need to sift through tapes, for one, and no need for reliable blogger uploads anymore to get at all those World Guitar “Nuggets” available in 2015. There are comps atop of comps in the World Music bin, and while many may be reaching, David Byrne’s Luaka Bop label seems to have a particular set of ears for the stuff. 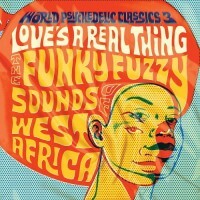 The tag here is “funky fuzzy sounds” on “Loves A Real Thing,” the third offering of the World Psychedelic Classics series. By the time you warm up to Keleya’s “Moussa Doubia” it’ll be clear that this comp has the funky sounds it promises, whether they be produced through a Brownian approach or P-Funk filter. Expect horn sections here and there… but not on the obvious standout of William Onyeabor’s odd electro-funk, which includes icy synths and sparse metronomic beats. More of his particular work can be found on “William Onyeabor World Psychedelic Classic 5,” if you haven’t seen that album everywhere yet.